Alpine SPS-610C Expert Reviews - Read Reviews and Buy Smarter Online. Verdict: A huge step up from factory of course but for a coaxial they sound awesome. You can't go wrong with alpine. Th hey were so easy to install. Verdict: Amazing sound...but only worry about durability coz it's made in China.. Verdict: This unit is replacing my aged IDE model. The sound clarity is average for Alpine, which in my opinion is better than any other head unit I've heard. Connections are versatile for RCA out and the Bluetooth function is very convenient. Verdict: A little more pricey but definitely worth the money!! I've never heard door speakers that pound hard like subs yet keep all the high freq. 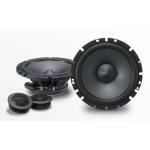 's intact would recommend to anyone who likes loud music that doesn't distort! Verdict: I needed a pair of 6.5" speakers for my Harley. Sure, I could have saved a few bucks with other brands, but have always known Alpine to be the best. I was not disappointed. The clarity and range of sound really sets them apart. For me, it's the only choice for car/motorcycle audio.